Give a dog treat gift basket as a thank you gift, a party gift, a thoughtful thinking-of-you gift when you go on a visit, or just because. Dog lovers will always appreciate that you remembered the dog! 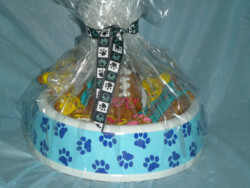 This dog gift basket is very simple to put together. It is also inexpensive. 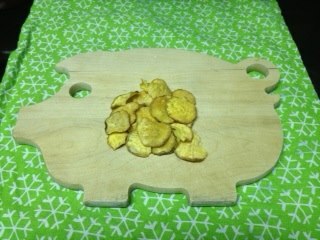 The real work is in making the homemade dog treats, which is also where love and energy are directed! 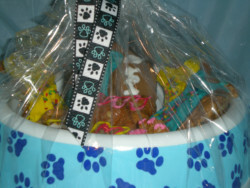 Homemade dog treats in various shapes decorated with dog treat icing in various colors. Add some sprinkled colored coconut or colored sesame seeds for additional decoration. Consider including different flavors so the recipients can sample your handiwork! A dog bowl that is either brightly colored or decorated with a "fun" motif. The one we used is made of plastic because we wanted to make sure it would not shatter if accidentally dropped on the way to the recipient. It has a fun paw-print design. You do not want to use a container that looks like it is old or cracking. Have you ever played that gifting game where all the party guests bring a wrapped gift and put it into a huge pile, then people draw numbers and take turns selecting a gift? They have to unwrap it for everyone to see, because the people with the higher numbers have a chance to steal the gift rather than pick a new one. We bring this up because people tend to choose the brightly wrapped packages, or the packages that look the most inviting and fun. Arrange the dog treats decoratively. The idea is to put enough in so that the bowl is filled, but all the various decorations can be seen. You do not want to pile in as many dog biscuits as you can. Quantity is not important - presentation is. Remember, people gravitate towards the packages that are inviting. Wrap the bowl with the treats in the cellophane. Make sure you use a large enough piece so that you can grab the ends and twist them at the top. Wrap a piece of dog-themed ribbon around the cellophane ends. If you like, attach a card.